But just a moment here, let’s actually look at this image. It’s time for Dak’s Overly-Deep Analysis Corner! The image is something we all know, that good ol’ glowing gateway between adjacent zones. Where is it, though? Remember after the Battle for Lion’s Arch, when we relaxed with the gang in the Dead End bar? Jory’s sister Belinda, one of the Seraph, mentioned that she was to be sent on a long expedition to Brisban Wildlands, going after rumors of some black market traders hiding out there. We know that Mordremoth is somewhere in the west of Maguuma… good bets right now are Magus Falls in the south, or the Wastes to the north. And for those of you who were playing 250 years ago, how would you get to those areas, from the areas that are now Brisban? Why, from the Henge of Denravi and Aurora Glade! 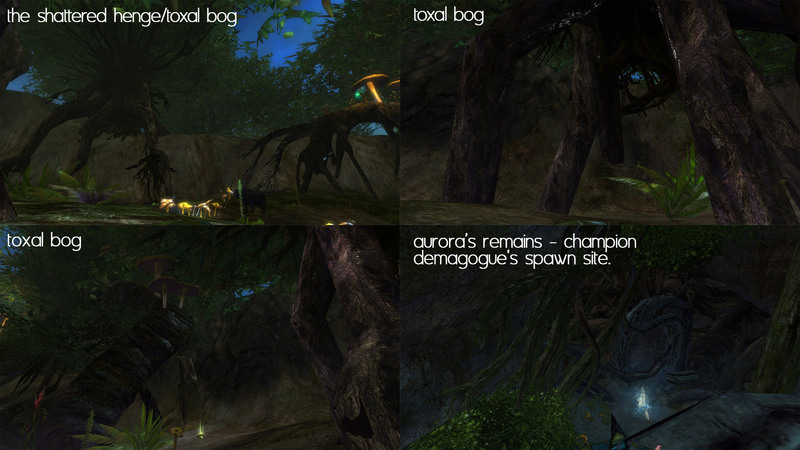 These two areas, quite close to each other, now lie in what is called Toxal Bog, in Brisban’s southwest corner. And wouldn’t you know it, the light quality, walls, ground, and trees are all eerily like the portal seen in the Season 2 promotional image. Some areas that look likely – light quality, ground, and large trees near walls all match the teaser image. Be sure to click the image to see them larger and in better detail! So, taken all together… what does that image really say about Season 2? I think it says we’re taking the fight to Mordremoth. Every previous dragon’s awakening has been followed by a massive catastrophe. 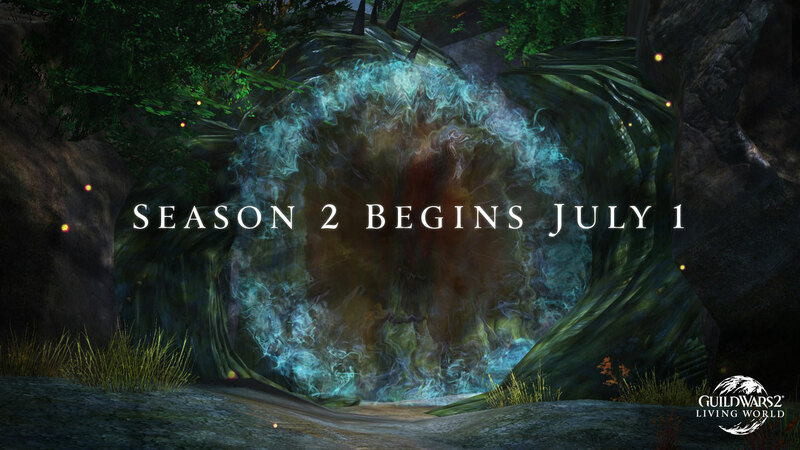 I think it says Season 2 will be a season of adventure, pushing deeper into those dense jungles, as we seek to end Mordremoth before even more destruction is wrought on our world. I think Season 2 will add brand new zones, one by one, as we search for the newest Elder Dragon. Perhaps we’ll travel through some old familiar lands… does Ventari’s Refuge still stand, two and a half centuries later? Is Quarrel Falls still as beautiful as the scenic outpost that amazed adventurers in the distant past? Soon, perhaps we’ll see. And I think I’m excited for what awaits. 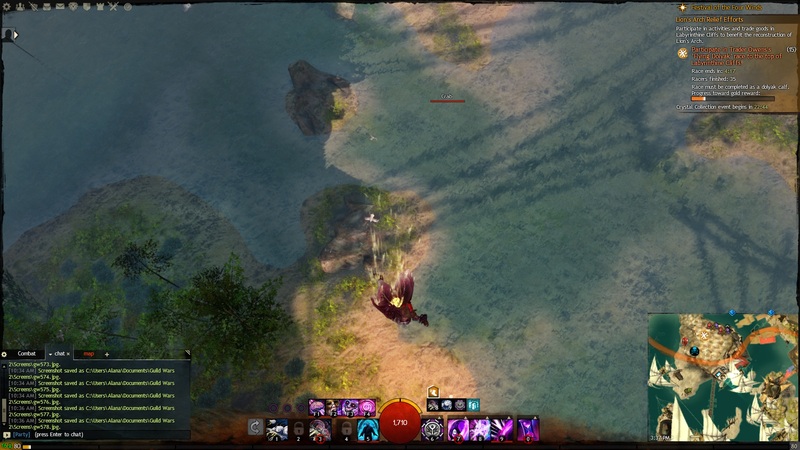 With today’s patch, there’s a curious thing visible on the map now…what appears to be a new path leading to a new zone from Brisban Wildlands. In particular, in the Toxal Bog. To be really specific, it’s located where the top-right screenshot posted above is, and it looks like it leads into (what was) Dry Top. 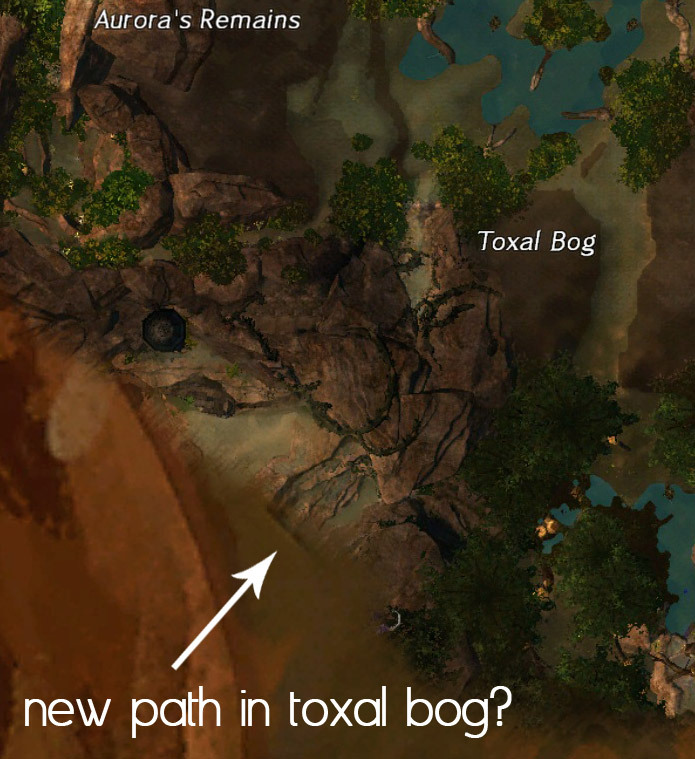 Location of the new path leading out of Brisban. Festival of the Four Winds has been around for a few days now, and there’s good and bad to it. There’s stuff I like, and there’s stuff I don’t. So what’s bugging me? Well, I’m going to start off with talking about the things I do like about the event. Baby dolyak race. It’s pretty great. Labyrinthine Cliffs remains one of my favorite areas in the game. It’s a gorgeous non-combat zone (there are things to fight, but for the most part you won’t ever draw your weapons), with a fair amount to do there. Sky crystals are back! Collecting these will test your jump puzzle skills, and while many are in the same places they were last year, there are also ones that have moved. There is also the addition of Master Sky Crystals, of which there are ten in total. They are supposed to be trickier than the regular sky crystals to collect. I haven’t gotten all of the regular crystals, nor all of the master crystals (I believe I’m at 24 regular crystals and 4 master crystals), but so far the masters don’t necessarily seem all that much harder than the regular crystals. I do remember some intensely tricky crystals last year, though! There are two new events this year, that I greatly enjoy over the ones they replaced last year. One has you collecting essences from various charged crystals around the map and bringing them to the bar in the second level of the Cliffs, and the other has you racing to the top of the map as a baby dolyak. It’s silly, it’s adorable, and it’s a lot of fun. It functions similarly to a guild rush, where you have to beware of traps along the way, but unlike guild rushes, the traps are much more forgiving – they simply knock you down or cripple you for a short while, instead of potentially killing you outright. There is one thing that the events do very well here, that I really like and allows everyone in the zone the ability to participate, as well as essentially guaranteed rewards for all. Each one works on a timer – you have a certain amount of time to turn in essences or race to the top. You then work towards different tiers of completion – the more racers that make it, or the more essences that get turned in, count towards getting that reward level to silver or gold tier. Even once it hits gold tier, you can continue to participate until the timer runs out. My only quibble with it is that the dolyak race only allows a person to complete it once – you cannot redo the race to help push the rewards to the next tier. As I’m used to guild rushes, where someone can complete it multiple times and each one count towards completion, and as the essence collection event allows you to turn in multiple ones and they all count, that seems weird to me, and as a result I’ve never seen the dolyak race finish with higher than silver. Also, as the Cliffs are largely vertical, you will still fall and die a lot, though the addition of nets in certain areas helps with that. I had been trying to take a screenshot from a crystal location. I stepped just a bit too far towards the edge of the rock though…whoops. Last time around, I didn’t really bother with the Queen’s Gauntlet all that much. I didn’t find it fun, and I found the fights to be annoyingly difficult. I didn’t even finish the first tier of fights. The Gauntlet has returned and your progress from last time is still available, and now there’s a new title for defeating Liadri: The Blazing Light. Not going to lie, I do want that title. I decided to switch over to my ranger to do these, as my mesmer simply lacks good sources of stability (tons of stunbreakers but…not enough actual stability) or snares, which are greatly helpful. Yesterday I finished off the first tier and sailed right through the second tier with very few problems. 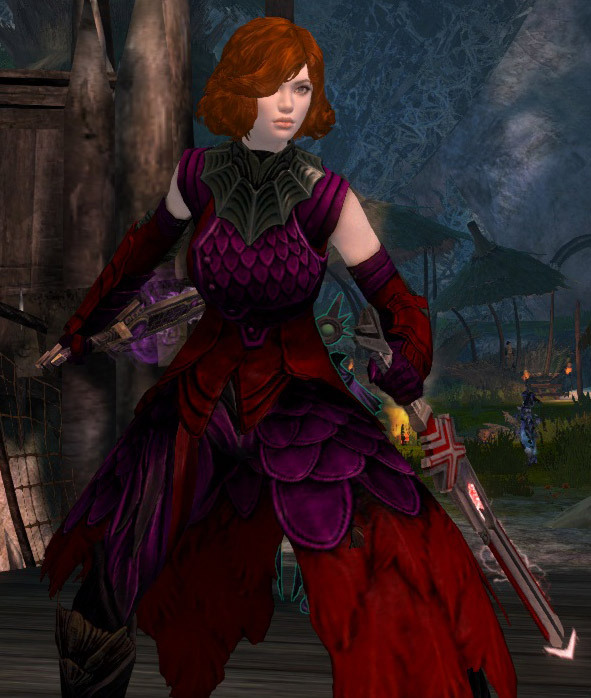 And I currently have a note taped to the corner of my monitor that says that my ranger currently has my ascended sword and gauntlet tickets…because if I didn’t do that, I’d log onto my mesmer, wonder why those items were missing, and panic. The Festival also has seen the return of many previous Living Story rewards. You can turn in the tokens you’re collecting for former meta rewards from different living story releases – there are skins like the Fervid Censer and Gas Mask, the Candy Corn node, as well as a variety of minis available to trade tokens for. The prizes average around 800 tokens, with a number of them at 1600, but gaining the tokens isn’t too terribly difficult – I’m sitting on just over three stacks right now, and you get 1600 tokens for completing the meta achievement. Now…the Pavilion. You’ll note I haven’t said anything about it yet. The Pavilion has changed a lot from last year, and while some of the changes are positive, for the most part…this is where the Festival really falls flat. Last year during the Pavilion at any given point in time there would be two bosses up at once; between bosses there would also be events where you would have to clear enemies off the ‘spokes’ of the wheel that the Pavilion is shaped as. On top of that, the Pavilion was a great farming area. There were veteran enemies everywhere (seriously – everything but the bosses were vets), and the loot was good. Perhaps a bit too good, but spending time in there was certainly profitable. Boss mechanics weren’t much to speak of, and generally they died fast. All six bosses run simultaneously now. Yeah, that’s all changed. Now we have Boss Blitz – an event where all six bosses are up at a time, and they must be killed within a certain period of time. The fast you get them down, the better your rewards are for the event – gold tier gets you eight champ bags and a few other items, where as bronze – when the timer’s run out entirely – gains you two champ bags and a green. The bosses have greatly upgraded mechanics, which make them more interesting to fight, and when they die, they pass their abilities to the remaining bosses. They also scale up to a ridiculously high amount of health if too many people are fighting them, which makes them take a very long time to die, so ideally people will split into smallish groups (about a dozen seems to work best) and each tackle a boss, aiming for near-simultaneous kills. Unfortunately, the game simply lacks options to really organize people in such a way – you can direct people via say and map chat all you want, you can try and get people to group at gates before the event starts so that everyone is split up…but realistically, it’s just difficult to coordinate people while playing the game. The UI lacks HP bars for all the bosses, so you have no idea how things are going in other areas. There’s no real way to tell how many people are in an area other than yours. There’s no way to call targets on anything for anyone other than party members. In other words, the fight is very anti-zerg, but it does not give us any way to try and break people from zerging. The Watchwork Knight fight had a buff you needed to obtain to do damage, and they made it so only so many people could have the buff before there were no more available. You could easily see how many of these buffs were left and thus you could easily tell how many people were in an area and it was easier to direct people around. I honestly am confused why a mechanic like this was not included. Something as simple as a UI pane that shows the HP bar of each boss, as well as how many people are fighting there, would make things so much easier to organize. Commander tags are generally useful for organizing players, but this is a place where they are actually a hindrance most of the time. If you have commanders on the map, you need enough so that there’s one for each group. That’s simply it. If you want to try for a gold finish, you will need at least four commanders – that are willing to work together – and preferably six, so that there’s one for each boss. I saw a suggestion on the forums that having a donation NPC (I’ll get back to that) at each gate, so that it would be easy to see how people are splitting, and for them to also sell temporary commander tags – one per area. If you have a large enough guild to fill a map, then you’ll be able to organize and get gold tier rewards – easily. But few are lucky enough to manage that. Now, there’s another big problem with the Pavilion, and that is that there is absolutely no loot to be gained there. The only thing that the enemies drop there are gauntlet tickets and festival tokens. There is no loot for killing veterans, there are no champ bags if you kill a boss, and there is no area chest once a boss has been defeated. I just…absolutely cannot understand why they did this, especially looking at the achievements. There are six different “kill 50 enemies” achievements – one for each enemy type present in the Pavilion. For all of those achievements you have to kill 300 enemies in total. And you will not get a single thing for it but a handful of tickets, tokens, and some achievement points. I can possibly understand them wanting to lessen the amount of loot that was dropped by enemies, but not remove it entirely. This is especially irritating, being as to get the Boss Blitz to start in a decent amount of time, you must donate money to Heal-O-Tron. Money that you will not make back in return. I see people on the forums complaining that the Pavilion last year broke the economy. Let’s get something straight here, people. The Pavilion did not break the economy. It helped it more than anything previously in the game (and since) had. It infused the game with a large number of materials and other items. What it did not do is introduce a large amount of actual gold – people were making money through Pavilion last year by selling the materials they were getting on the trading post, which is a minor gold sink, and were getting their money from other players. What broke the economy and got it into the state it’s in now was the large amounts of gold that were introduced once champion train farming took off. When the Chaos of Lyssa recipe finally appeared on the trading post, this is what it was selling for. Note how many were available. As of writing, there are zero available on the trading post, and buy orders are now up to 1300g. The other major problem that’s being seen is, as ever, RNG rewards. Sanctum Supply Boxes are meant to have a chance at dropping some of the previous LS items, as are the Gauntlet Chances that you get for winning a fight in the Gauntlet. The screenshot of the Chaos of Lyssa recipe when it appeared on the trading post yesterday just goes to show how incredibly rare these items really are. Rare drop rates on RNG rewards are nothing new. RNG is how GW2 does its major rewards. I hate it, but it’s simply what they tend to go to. The truly annoying thing is that these items, the supply boxes and chances, are by no means easy to get. Supply boxes you can get by turning in various materials – a thing that caused the price on many mats to instantly leap in price. Chances are gained for defeating enemies in the Gauntlet – one for winning, and additional ones for using gambits. Why don’t these work like previous boxes have? Why don’t they drop from regular enemies? Why aren’t you able to trade tokens for them? Something like that would instantly cut the rarity on these items. The Wings of Dwayna and Shadow of Grenth recipes were rare drops from Wintersday presents, but they weren’t so rare that getting one would make you rich. Even now they’re only a few gold apiece. I was really hoping to get the Sun and Wind Catcher skins, since I didn’t buy them last time. I really want that Chaos of Lyssa backpiece. But with the rarity of these items, I cannot see that happening. I don’t have hundreds of gold. Right now I don’t even have a hundred gold, and my plan for making some money during this patch has been dashed. There is a good amount to this patch that I like, but overall, it leaves me with a poor taste. It’s just…disappointing. I had initially hoped that the lack of drops in the Pavilion was a bug, but as there’s been several bug fixes since Tuesday and not a word has been mentioned about that from any official channels, it clearly was intentional in design. I can’t see any reason to go into the Pavilion once I finish those achievements unless I’m just going to go do the Gauntlet. The Cliffs will keep me interested until I finish finding sky crystals, but that’s about it. The patch as a whole just feels like a step back from previous events like this, and a lot of it has left me rather disheartened. Give us ways to organize people in the Pavilion easily. Give us rewards for all of the things we need to kill in there. Make the RNG rewards more obtainable. Throw us a bone, and make it worthwhile. Please. It’s been some time since we’ve gotten a content-based update in Guild Wars 2, hasn’t it? I didn’t realize how spoiled I was by the biweekly release schedule until the first arc of living story ended. But next week that changes, with Festival of the Four Winds! The Zephyrites are back in the Labyrinthine Cliffs, and Queen Jennah is reopening the Crown Pavilion and the Queen’s Gauntlet. Now, as I wrote about last year, those two particular updates were my favorites of the living story as of yet, and at this point, they still remain very high up there amongst the content that I loved best. They were fun, they were full of things that would definitely last you the full time of the patch being around, and they also added quality of life features that were greatly helpful. They were also ones I really wished would have been permanent in some manner, so seeing them return has me excited. Also I really love the design of the pavilion area. Now, both the Bazaar and the Pavilion last year brought a lot of new things to the game, and there were a number of other things that happened with it due to the new stuff. These patches were the ones that introduced the ability to craft Celestial gear, achievement chests, champion loot, dungeon rewards, and the account wallet. While they were primarily content patches, both also contained a number of quality of life changes that, at this point, I can’t imagine not having. Sure, I became very sour on champ bags after a while, but it’s nice to see enemies that are meant to be some challenge give guaranteed loot. The account wallet keeps my bank under control (in theory. It’s still a mess, but at least it’s not due to dungeon tokens!). Achievement chests are a nice little extra reward for doing things in the game. Guaranteed dungeon rewards are great, as I enjoy doing dungeons. Celestial gear was less important for me, but selling quartz crystals is a steady handful of silver a day (so long as I remember to go gather in my home instance), so I’m okay with that. So the first thing I’m wondering is, are there going to be any other new things added in with this update? Now, I know that the big feature patch happened just a month ago. But there’s still plenty of little tweaks that could be added. We still know that precursor crafting is a thing that will be coming at some point, though I see it highly unlikely to be happening now. If it was, they would have said something about it, because there’s been requests for precursors to be fixed since launch. But there are other things I could see being added in. Trait unlocks being tweaked, or adjusting megaserver algorithms. Celestial crafting is a bit…involved. There’s also the question of, what exactly from those two patches last year will be returning? I still have Fortune Scraps in my bank, for example. Is it safe to assume that they’ll be usable again? As the Bazaar was when Celestial gear was added to the game last year, and the only time recipes were obtainable, will those be dropping again? Personally, I have no interest in Celestial crafting, but look at what you’ll pay just to get the recipes for a set of light armor right now. I really feel for anyone who didn’t get those last year while available, and then decided recently that they wanted Celestial gear. Ouch. Personally I think they also should no longer be account-bound. Crafting has actually become profitable now (well, for some items), so give people who like crafting another bone, okay? The other thing that will be interesting to see is how the Pavilion is going to effect the current game economy. The Pavilion is basically one huge farm – more vets than you could hope to count, events happening frequently, and lots of loot to be gained. It was a fun farm, though, and very lucrative (especially if you farmed things other than destroyers). The prices on a lot of things dipped last year during this, both due to farming the Pavilion and the addition of champ bags. Precursors saw a price drop (not a huge one, but still enough to be noticeable). Many T6 mats went down a bit, while vicious claws absolutely tanked in price – I remember buying a stack for 8s a claw. Destroyer lodestones also saw a price drop that they’ve never really recovered from. Without much information about what will actually be included in this update, as far as things returning from the previous two updates as well as new stuff, it’s hard to really say. However, I will say this much. I loved Bazaar of the Four Winds. I loved Queen’s Jubilee. And I will be playing the hell out of Festival of the Four Winds. 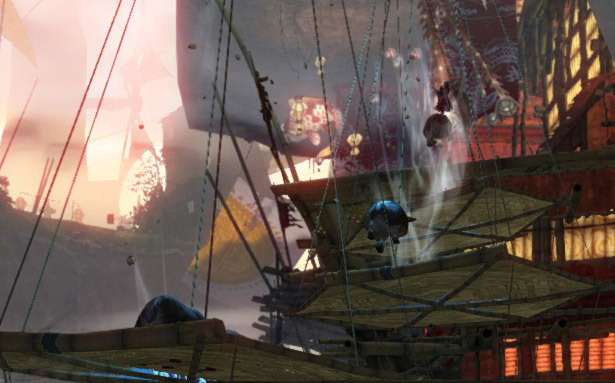 As far as the game goes, stuff in Guild Wars 2 has been a bit light as of late. The feature patch has settled in and everything has turned over to megaservers. There’s as of yet no news as to when Living Story season 2 will start. The game has launched in China, though that has little to no effect on us. Basically, there’s not much happening right now! And as such, I thought this was a good time to just sort of sit down and go over some of the things I’ve been doing lately. So what have I been doing as of late? As I’m sure I’ve mentioned already, I finished the Minstrel back at the start of April, bringing my legendary weapon count up to three. I think I’m going to take a break from making legendaries for now; I’m at a point where there’s only one or two that I haven’t done yet that I’d consider making. The price of precursors is currently ridiculous, so I’m not even going to start thinking of that for a long time. There are other things I’d rather work right now anyway (I want the scepter Immobulus, for example), so I’m good on legendaries. Rianna Xi, the newest of my level 80s. My baby thief that I made the day of the feature patch has hit level 80, and I came up with a ridiculously silly and fun build to run on her. She is based on a roleplay character of mine, so to remain true to the character that limited me in a lot of ways – for example, pistols cannot be used. Main weaponset had to be melee. Luckily, dual-wielding daggers on a thief perfectly matches said character. 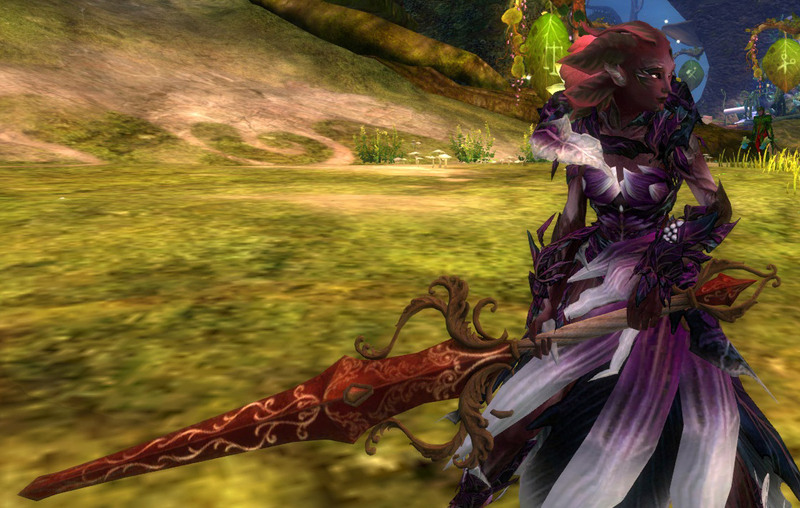 Peacemaker and Dark Asuran daggers were as close to the look I wanted as I could get, but they match pretty well. The build I’m using is 4/4/0/6/0, based on signets. It’s very powerful, it keeps you alive forever, and it’s terrifyingly effective. I’m having a great deal of fun with it. For all that I’m unhappy with the current trait system as it stands now, leveling to 80 with such a limited trait selection did mean that I wound up using ones that normally I wouldn’t have played around with, and found them to be better than I had expected. So there was that. This was also the first character I leveled up where I didn’t do any crafting. I got to level 50ish and at that point decided I was determined to play through to 80 without getting any levels from crafting. As a result I actually made a pretty significant amount of money while leveling – I did tons of gathering, and the 50-70 zones in general tend to be good for money due to the t4 materials you can get there. This also brings my total number of level 80s up to 10. I still have 7 characters that are unleveled – two (asura elementalist and human guardian) are in the mid-40s, the others are all in the 20s. I’m undecided yet as to who to level next. 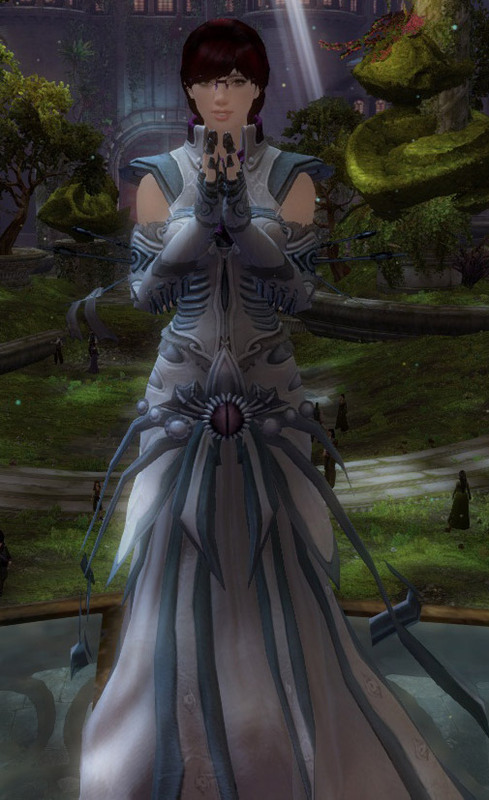 Logic would say finish the elementalist or guardian, but I find myself drawn to my sylvari necromancer. As I’ve written about previously, I’ve been doing some sPvP as of late. It’s a fun way to do something different while in game. I also like to mess around in Edge of the Mists. 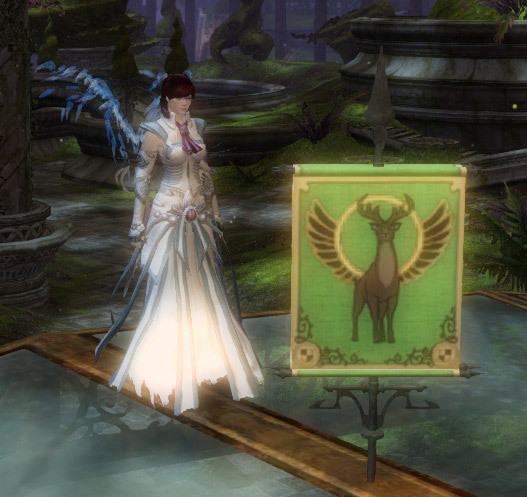 I’m still not a big WvW person, but EOTM is fun. 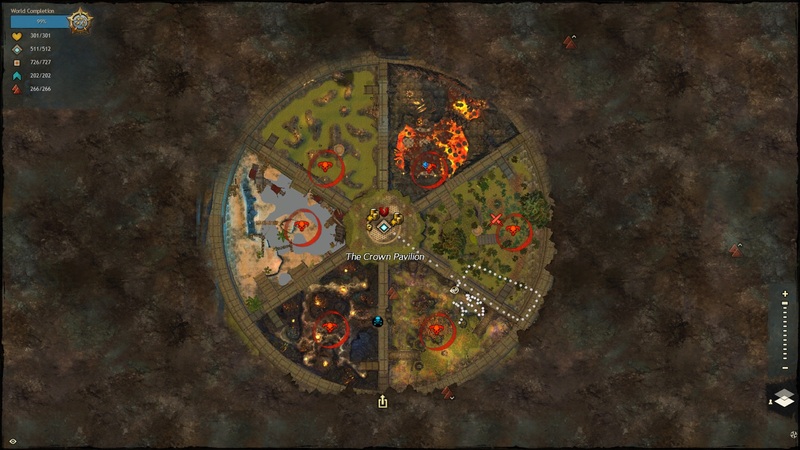 I do really hope that a lot of things that were done in there are brought into WvW proper, such as varying the bosses for different areas you’re capturing. I’m always in favor of boss mechanics that are more than just “lots of HP”. Even though she has to share, of course my mesmer gets the new toy first. Since ascended items are now fully account-bound, I decided to bite the bullet and make plans to make some ascended weapons. Yesterday I finally leveled my weaponsmithing to 500 and made an ascended greatsword. In a few days I’ll be adding an ascended sword as well. My mesmer gets first dibs on the shinies, of course, but these two weapons will be shared between her, my ranger, and my guardian. I cannot recommend enough that if you are going to craft ascended weapons, to farm as many of the materials you need yourself. I waited until I had almost all of the materials I needed for the swords themselves before crafting to 500, and in that time I was also able to collect fairly large amounts of orichalcum, ancient wood, ecto, and t6 materials. By the time I hit 500, despite having to buy more materials along the way, I had actually made a pretty good chunk of profit from selling the weapons I had made – by the time everything sold I had about 30g more than I had started out with. Everything else has been more of the same, really. Running dungeons with my guild, doing gathering runs. I’ve been starting to hit world boss events every so often again – I had stopped doing those after the feature patch because I’m not a big fan of the schedule, but there are some good timers available now that make it easier to keep track of what is running when. My former Orr gathering runs have been replaced with gathering in Sparkfly, Timberline, and Maelstrom. I’m finding it to be as profitable as running in Orr was, as platinum and hard wood are so much more plentiful than orichalcum and ancient wood are to gather. All of these things mean I am able to steadily make a consistent amount of money. I’ll never be one of those people who is insanely rich (from playing the trading post, generally), but I generally sit comfortably around 100g. That’s enough money for my general needs and wants, so I’m happy with that. 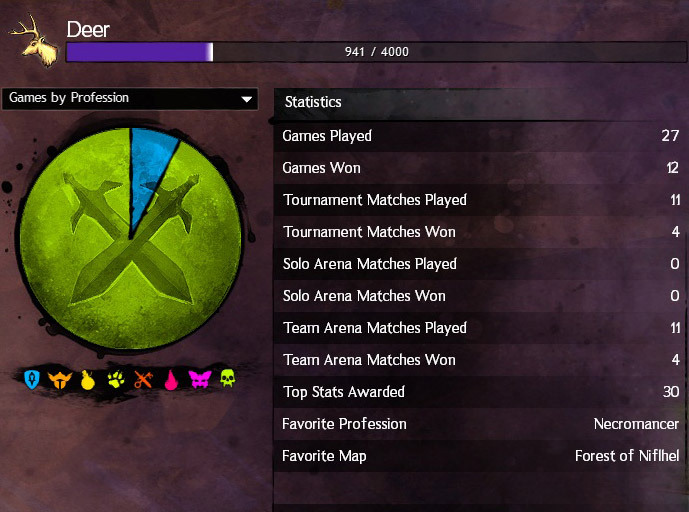 So yeah, in a nutshell, that’s been what I’ve been up to for the past month or so in GW2. Anyone else up to anything new or fun? Today I would like to introduce you to a character of mine. Everyone, this is Carella, my necromancer. She was the…fifth character I got to level 80, if I remember correctly? She’s gone through the most changes of every character of mine except for my mesmer; when I first made her I was playing her as a straight condition necro. Rabid gear, Runes of the Undead, all that fun stuff. Her original armor set was a mix of Priory and (what is now called) Seer, the named exotic set. A few months later I decided to change to a more straight DPS-heavy build, going heavy on power, and made a set of berserker armor. The main focus off this set was to be the Orrian leggings, from Arah. Initially I was going to use the Orr temple armor top, but I didn’t have enough karma, so I bought the Whispers top instead as a temporary replacement, and decided that fit even better. Some adjustments came over the following months, until finally I had something that was just right, both in looks and stats. She is, however, one of the very few characters of mine that hasn’t had an actual makeover kit applied to her appearance – I made her to look like me, and always had the idea of throwing away the idea of necros being dark and creepy. So she’s stayed cheery and cute. She now switches between wearing bunny ears and glasses, because both are awesome to wear into battle. Carella is also the character that I leaned towards using when I considered doing sPvP. I did a few games here or there, but after the feature patch, I decided to give it another go, due to the new changes made. It still isn’t my favorite game mode, but…I actually enjoy PvP. So, how the heck did that happen? Well, to start out, there’s a few different ‘types’ of sPvP. There’s custom arenas (also known as hotjoin), solo queue, and team queue. Hotjoin is when you just hit the Play Now button and get thrown in a game. It’s fun if you just want to play a quick game, but the rewards for this game type are the lowest. They also tend to be very “every person for themselves” since it’s hard to communicate while playing (if you stop to type while in a PvP match, you are an easy target). But they can certainly be very fun! Solo queue and team queue are more organized, and the rewards you get reflect that. They’re ‘tournaments’, as opposed to the casual hotjoin games, and they have leaderboards. If you’re by yourself, you can pick solo queue, and it’ll place you in line for a game. When I’m playing alone, I tend to not want to wait for that, so if no one else is on I’ll just do hotjoin. Patience isn’t my thing. Team queue, on the other hand, is what I’ve been doing a lot of as of late. Team up with some guildies, and cause some chaos. I like these because then I’m playing with people I know and we can coordinate what we’re doing (yay for TeamSpeak! ), which makes things much easier. Since several of my guildies that I play with frequently are much more into PvP than I am, this also means I’m able to get valuable advice from them as to what to do and what not to do. So what have I learned in sPvP so far? Well, first of all, knowing the layout of a map is going to be one of the most useful things to you. Some maps are easier to learn than others (Forest of Niflhel is my favorite), but they all have unique layouts and mechanics. You want to know how to get from your spawnpoint to all of the other points on the map – preferably multiple ways of doing so if you like sneaking around to capturing the far point on the map. As I said…I’m new to this. Distracting is good, sacrificing yourself less so. Running into a point that the enemy team has captured and is sitting on and promptly dying helps no one but them. Your team is down a person while you respawn, and they scored points from killing you. On the flip side, though, if you can stay alive long enough for another person or two from your team to catch up, or are able to de-cap one of the enemy team’s points so they are no longer getting points from it…distraction. When I’m playing hotjoin, if the enemy team is camping out on the midpoint, I’ll frequently go and capture the far area, which then draws them away, which then (if the others are paying attention) lets us go in to capture mid. The way you play in PvE is going to be very different than PvP. Some skills work differently, yes, though PvE/PvP splits are few and far between. The bigger thing is you’re playing against other people who are going to actually react to what you’re doing, instead of just balling up all nice and neat against a wall for you to spike to death. They will move around, dodge out of the way, stun you, fear you, knock you down, and you need to be able to react to that. I play Carella as a damage/condition hybrid in PvE; in PvP I go for conditions and minions. Yes, I know, minion necro is cheap and easy. That’s why I do it. I’m not familiar enough with PvP to want to start messing around with something new when I know I can do this well. Conditions are so much more viable in PvP than they are in PvE, and minions make great meatshields. More than once I’ve rallied off of someone who bled to death from bleed stacks I put on them before going down myself. Try and communicate with your team. Even if all you can do is type in chat “going far” or “thief near mid” or “2 home”, that’s valuable information that will make thing easier for everyone. Reward tracks! I should go do that next tier of Arah already. 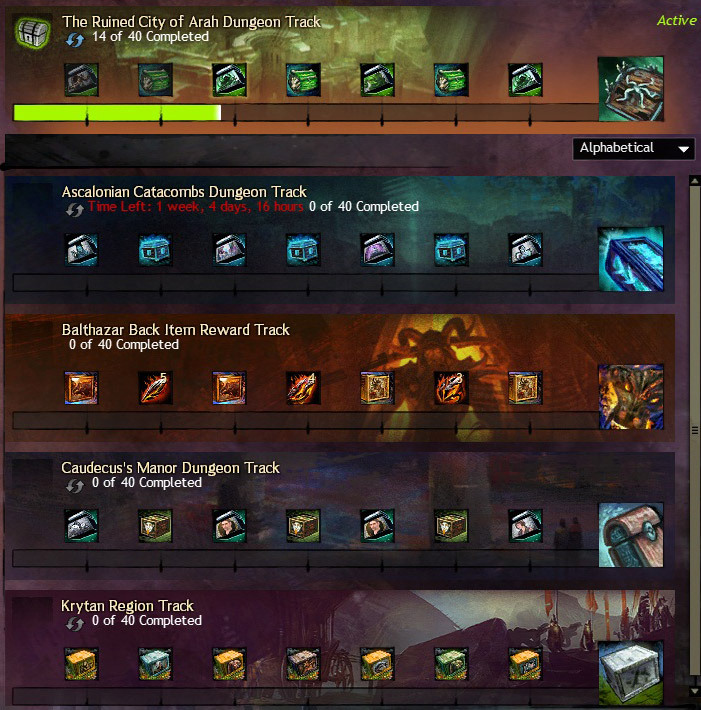 So I’m not going to lie, the new reward tracks are a large part of why I decided to try PvP. There’s a number of different tracks you can activate, each becoming available in different ways, and then you work towards specific rewards. I’m currently doing the Arah track, so as I progress I will be getting Arah tokens, weapons, and a piece of armor. After that I may go do the Kryta track. Not decided yet! 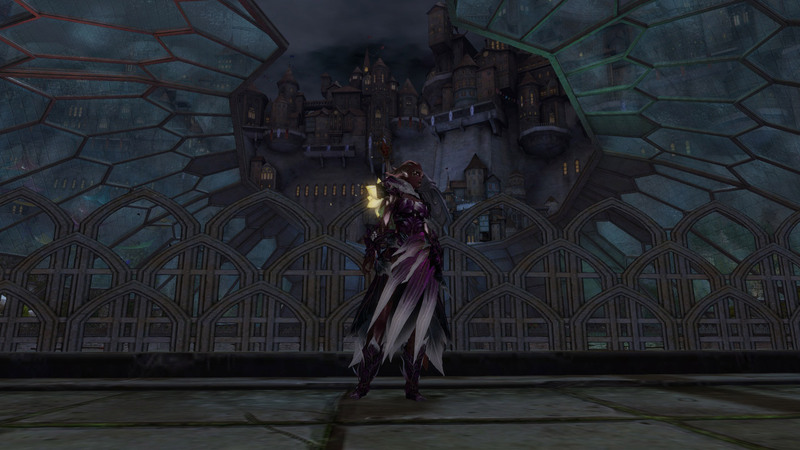 The nice thing is I can switch to another one – say I decided I really, really needed the Balthazar backpiece (I don’t, I think it’s ugly, but that’s besides the point) – and the progress I’ve made on the Arah track is saved for when I go back to it. You also get reward chests as you rank up, but as ever, these are heavily RNG. I’ve yet to get anything decent from any of them. One of my friends has gotten a number of exotics. My fiance managed to get an ascended armor chest (Zojja’s, naturally), his very first PvP match. Talk about luck. But you still get stuff, as well as a gold reward when finishing a match, so it isn’t a choice between playing PvP and playing something in-game that will earn you money. You can do both. There’s one more thing I didn’t mention yet, and that’s Team Deathmatch. It’s a new mode that was added, and isn’t fully supported, so you will only see it (and the map it’s available on, Courtyard), on player-owned custom arenas. It’s exactly what it sounds like – the map is tiny, with two spawn points and a courtyard between the two, and you simply go in and…try and kill the other team. That’s it. It can be a lot of fun, but it can also get unbalanced very quickly, and spawn-camping can be an issue. It is a highly entertaining fast-paced game mode, though, so if you see an open custom arena with it available, give it a try! So, yeah. PvP. It will never be my favorite thing in the game, but it’s something that I’ve come to have fun with and play occasionally. I’d suggest, if you’ve never tried it, to give it a go. Who knows, maybe you’ll enjoy it too!